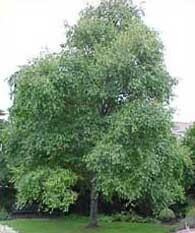 The Evergreen Alder or Toorak ‘Gum Tree’ Alnus (Alnus jorullensis) was first marketed in the early 70’s as the Evergreen Silver Birch. The Toorak ‘Gum Tree’ Alnus quickly became Melbourne’s most popular evergreen tree. It was easy to grow, it grew 6-9ft per year for the first few years and had cascading fine foliage, just like a silver birch. The suburb where they became most popular was Toorak. 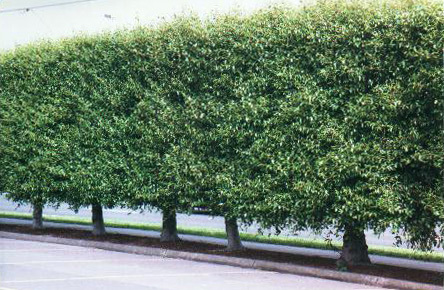 In Toorak, households planted them on nature strips and planted them in front yards and as screening trees up the side of houses. Unfortunately because they were a new product, people didn’t know how big the Toorak ‘Gum Tree’ Alnus would grow, nor did they know how easily the Toorak ‘Gum Tree’ Alnus could be shaped and pruned. This lead to people planting large numbers of Toorak ‘Gum Tree’ Alnus in inappropriate situations. They were allowed to grow, without pruning, to their full size, often with several trees planted into courtyards or tiny gardens. A full sized Toorak ‘Gum Tree’ Alnus, as with any trees, can create problems when planted in the wrong spot. The inappropriate planting and management of the Toorak ‘Gum Tree’ Alnus gave the tree a bad name and created a Toorak ‘Gum Tree’ Alnus backlash. In spite of the backlash the Evergreen Alder or Toorak ‘Gum Tree’ Alnus, Alnus jorulensis are still one of the top selling evergreen trees as they grow in any soil, even waterlogged, heavy clay and subsoil and if they are kept grass free around their base, well watered and fertilised they are capable of growing 9ft per year for the first few years. A dense pleached hedge of Toorak Gum Trees. These days gardeners are learning that if Toorak ‘Gum Tree’ Alnus’ are pleached or pruned to contain their overall size this prevents them from developing oversized trunks and root systems. Toorak ‘Gum Tree’ Alnus love to be trimmed. The harder you cut them the branchier and bushier they become, creating a dense screen. At Hello Hello Plants we can access a supply of Toorak ‘Gum Tree’ Alnus, and that’s because one day each year we go to the leafy streets of Toorak and collects the ripe seed pods from the best looking Toorak ‘Gum Tree’ Alnus’ surrounding some of the best homes in Melbourne. It normally take 5 or 6 hours to pick enough seed pods to grow a years supply of Toorak ‘Gum Tree’ Alnus. Chris likes to pick them himself as good seed selection is critical in controlling the quality of the trees. Also Chris enjoys his day out in Melbourne’s leafiest suburb, as picking seed has been a tradition of Chris’ for nearly 30 years. So if you’re looking for an economically priced fast growing hardy tree that loves to be controlled, consider ordering a Toorak ‘Gum Tree’ Alnus or two.